The Salvador Dalí Museum is the home of the world's most comprehensive collection of the renowned Spanish artist's work. Collected by A. Reynolds Morse and Eleanor Morse (close friends of Dali) over a 45-year period, it is celebrated for its 96 oil paintings. Art connoisseur or not, you will be enthralled by this St. Petersburg Florida tourist attraction which pays tribute to the czar of surrealism, Salvador Dali. It has become one of the most popular Florida tourist attractions. Dali is best known for his dreamlike paintings in which he showed people and objects transformed into fantastic images that were often set in deserted landscapes. Upon entering the Museum you find yourself confronted with Dali's work which can be a real "mind-bender". It's recommended you take a Guided Tour which informs you of the artist's work and what he was trying to convey. Half the fun is comparing your perception with that of the artist! Florida's top-rated museum offers constantly changing exhibits that present a variety of activities including films, gallery talks and special exhibitions throughout the year. Like other Florida tourist attractions, the museum frequently changes what the public is going to see to keep interest at high levels. Mom and Dad can introduce the kids to the world of avant-garde at the Museum on Saturdays from 11:45am - 4:30pm with "Dilly Dally with Dali", an enlightening program of games, puzzles, arts and crafts and activities. Other programs include "Breakfast with Dali", one Saturday a month from 9:00-11:00am, where children can take a tour followed by breakfast (fee and reservation required) and "Coffee with a Curator" the first Wednesday of each month with StarBucks Coffee followed by a tour at 10:15am with a Dali Museum Curator. This is free with paid admission. While exploring the fascinating gift Shop keep in mind Salvador Dali was a Master of Marketing. His merchandise is to be found nowhere else in the world. You can shop on-line by visiting www.theDali.org/store. 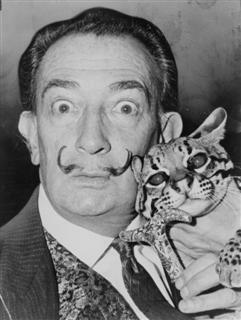 This Dali Museum article is by Greg May of Orlando, Florida. The Dali Museum in St. Petersburg Florida is open every day from 10:00am-5:30pm. On Thursday nights the Museum is open until 8pm. Take I-275 to exit #22 (old #9) and follow I-75 East to its end at the light on 4th Street South. Continue one block further to 3rd Street South, turn right and continue 1/4 mile to the Museum.